Listen to how your interlocutor is feeling. Creating a great emotional relationship with consumers and engaging them emotionally is the true magic behind building successful brands. 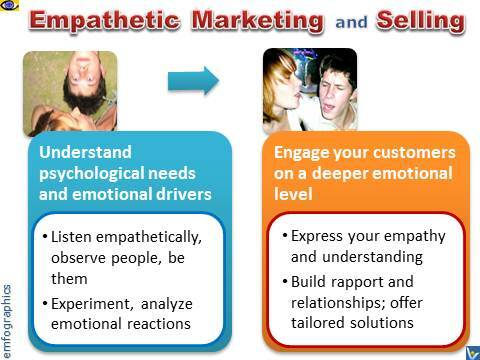 Marketing strategies based on good understanding of core emotional drivers of consumers will not only lead to a better connection between the customer and your company, but also to deeper and longer-term satisfaction for everyone involved. Internet and social networks opened a new era of ICT-powered empathy marketing. The social web has led to creation of new habits and more personalized needs of customers. It has also humanized the web and paved the way for a more collaborative way of doing business between firms and customers. It created a platform for consumers, marketers and innovators to talk to one another, build relationships, exchange views and ideas. 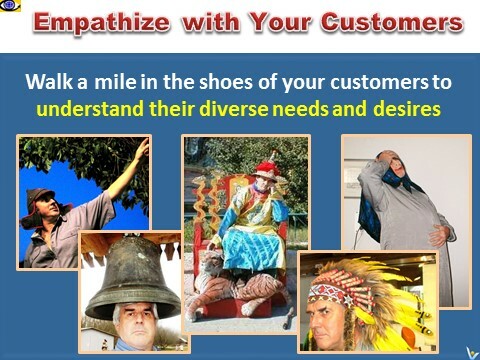 ① Recognize that your customers are individuals with their unique problems, desires and goals. ② Get to know your customers for real, observe them, stay close to them, listen to them empathetically, be them in order to understand their psychological needs and emotional drivers. ④ Design a clear path for translating these emotional insights into successful brand strategy aimed at engaging your customers on a deeper emotional level. ⑤ Create a framework for incorporating these concepts into your business to optimize customer engagement and return on investment.